Roses allover stencil pattern - Floral wall pattern stencils at great prices! SMALL: sheet 17.7" x 20.5", design 14.6" x 16.5"
LARGE: sheet 30.7" x 33.5", design 27.7" x 29.5"
--Roses are red, or whatever color you want to stencil them! Our Roses Allover Stencil looks fantastic in any color. This classic stencil pattern looks great above a chair rail in the dining room, as an accent wall or even stenciled on the floor or ceiling. A natural beauty! Perfect choice for the little girl's nursery! The stencil comes in 2 sizes that have exact same scale of the flowers. Smaller stencil is better for tighter spaces and various crafts, and large stencil is good for large accent walls. Paint your Roses red, or whatever color you want to stencil them! Our Roses Allover Stencil looks fantastic in any color. This romantic and feminine stencil pattern looks great above a chair rail in the dining room, as an accent wall or even stenciled on the floor or ceiling. A natural beauty! Perfect choice for the little girl's nursery! Every girl - big or small would love a wall of roses! Change your decor simply and easily by stenciling our Roses pattern. 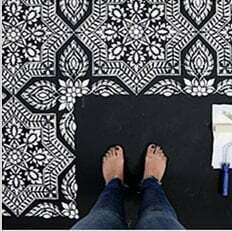 You will love the creativity of doing it yourself as your next DIY project. This stencil comes in 2 sizes that have exact same scale of the flowers. Smaller stencil is better for tighter spaces and various crafts, and large stencil is good for large accent walls. The stencil is made out of durable 12 mil clear plastic stencil material. This material is strong but flexible, reusable and easy to clean. We love it so much more than standard 8 mil Mylar! It's not brittle, user friendly and just so easy to work with. In our many years of professional stenciling this material has proven to be far superior than any other stencil material we used. Our customers love it too, and we are sure that you'll notice the difference! Our stencils will last a long time and are a pleasure to use.